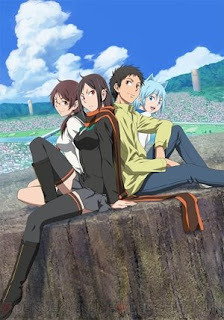 Yozakura Quartet is the perfect example of how I’m easily influenced by promotional material. As it is the case with books or CDs – which I usually choose based on the cover artwork – I tend to pick shows that appeals to me even before I’ve watched any episode. It’s probably not the best way to decide what to watch, but well, that’s how I am. 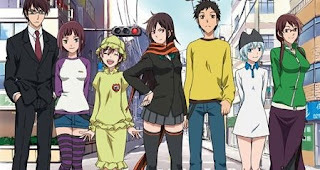 And the picture above is what made me want to pick up Yozakura Quartet this fall. Let me say right now that I’m happy to have done that. Even if the story is pretty light-hearted, at least up until now (I still need to watch the final two episodes), it still has its moments. The music is really enjoyable, too, but what makes the show really great is its characters. Their design is really excellent, and none of the main protagonists is annoying. I had some doubts about Ao (the one dressed in white) at first, but in the end she proved to be a nice addition to the Quartet. And of course, there’s Hime, the Mayor of the town and her scarf. She’s clearly the main focus of the story, and is a surprisingly deep character. She’s not a typical heroine to say the least, and some quirks of her personality are pretty funny. So here’s my 4th favourite anime moment of the year : Hime bragging about how cool she was during a ceremony in episode 5. Along the course of the series, you see Hime in a lot of different situations : as a brave fighter, breaking down under the pressure, as the responsible Mayor, or as someone who has lost a dear friend in the past. Most of which are typical of many other anime characters. But, for some brief moments like the one pictured above, you see she’s still a young girl, completely natural. And like many, she can’t help but to try to draw the attention to her role in the ceremony that happened a moment ago – and during which she’s dead serious, of course. However, like it would happen in real life, the others get distracted rather easily, and she gets frustrated that no one seems to care about her heroic behaviour. 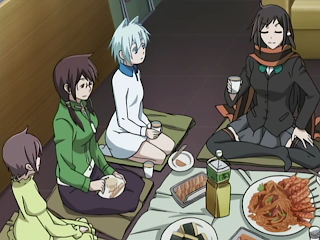 So, in a sense, it’s a scene that contains a prime example of what I love most about Yozakura Quartet : Likable characters acting in a believable way. Not to say that the rest isn’t great, of course, but I really think the show wouldn’t be worth as much without its cast, and especially Hime. I particularly loved the characters — & especially Hime — too. Great pick.